In urban areas, the tree canopy provides an important stormwater management function by intercepting rainfall that would otherwise runoff paved surfaces and be transported into local waters though the storm drainage system, picking up various pollutants along the way. Urban tree canopies also reduces the urban heat island effect, reduces heating/cooling costs, lowers air temperatures, reduces air pollution, increases property values, provides wildlife habitat and provides aesthetic and community benefits such as improved quality of life. For best results on an urban tree canopy and planting plan is to begin with an assessment of the current tree cover in the jurisdiction. Widely accepted as a practice not only for the Chesapeake Bay, but trees have been shown to reduce energy costs and improve property values. Moderate. With properly trained professionals and motivated volunteers, local jurisdictions have made significant advances in increasing the urban tree canopy. 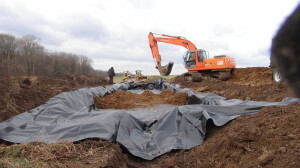 Implementation of these practices are likely to become part of future stormwater nutrient reduction strategies for Phase I and Phase II MS4 jurisdictions. Consequently, the funding strategy for this practice will likely be embedded in the MS4 strategies in the future. The Maryland Department of Natural Resources Forest Service continues to pursue funding and staff support for key implementation programs. Chesapeake Bay Trust Restoration Program Grants are a competitive source of potential funding. K&H estimates 2.64 acres of impervious surface treated per acre of practice. Therefore, the value from the K&H report was multiplied by 2.64 to obtain these figures. State Highway Administration estimates that costs will be significantly lower where lad does not need to be purchased, and that the lifespan of a tree planting project can be significantly higher than 20 years. Trees must be monitored closely for the first few years with frequent watering and periodic mulching. Trees are an excellent carbon sink and reduce the heat island effect in urban settings. Underground and above ground utilities must be located and considered. Choose the appropriate tree for each location as some trees can cause sidewalk damage or are not necessarily suited to urban setting even if the tree is a species local to the area. A total of nine planting projects were undertaken on public and park properties throughout the county. Over 2,500 native trees, plants and grasses were panted in total and over 100 Caroline County students participated in the projects. The City of Cambridge in partnership with Washington College’s Center for Environment & Society (CES) and the college’s Geographic Information Systems (GIS) laboratory assessed Cambridge’s tree canopy in the core neighborhoods and over existing impervious surfaces; and to produce a Community Forest Master Plan for the city. Also, CES assisted Cambridge in managing a public tree-planting demonstration of at least 58 street trees involving residents of the city and local students, especially in disadvantaged neighborhoods. The Town of Easton Street Tree Planting Project supported the doubling the number of new street trees during 2015. This project is aimed at reducing the pollutant loading associated with urban sector stormwater, and at increasing the Town’s tree canopy. The grant paid for the planting of 140 street trees.